For other uses, see Red onion (disambiguation). Red onions are cultivars of the onion (Allium cepa) with purplish-red skin and white flesh tinged with red. These onions tend to be medium to large in size and have a mild to sweet flavor. They are often consumed raw, grilled or lightly cooked with other foods, or added as a decoration to salads. They tend to lose their colour when cooked. Red onions are available throughout the year. Red onions are high in flavonoids, and fibre (compared to white and yellow onions). Known varieties include 'Red Zeppelin'. The skin of the red onion has been used as a dye. The red onion from Turda (Cluj County, Central Romania) (Romanian: "Ceapa de Turda",) is a local variety of red onion with light sweeter taste and particular aroma. The area of cultivation encompass the lower Arieş valley and the middle Mureş valley. Turda onion bulbs are traditionally intertwined into long strings (1–2 m) for marketing purposes and can be found at the traditional markets all over central Romania. "Turda Red Onion" is usually served fresh, as a salad or part of mixed salads and especially as a compulsory garnish for the traditional bean-and-smoked ham soups. 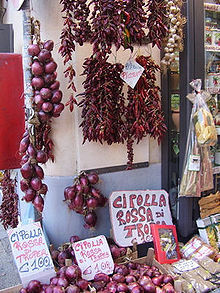 The red onion from Tropea, Italy, (Italian: "Cipolla Rossa di Tropea") is a particular variety of red onion which grows in a small area of Calabria in southern Italy named Capo Vaticano near the city of Tropea. This onion has a stronger and sweeter aroma and the inner part is juicier and whiter than other red onions and it is possible to make a jam with it. In March 2008, the European Union registered the Protected Designation of Origin mark for the red onions produced in this particular area. In the United States, one of the most prominent cultivars of red onion was grown in Wethersfield, Connecticut, and was a major source of onions for New England until the late 1800s. ^ a b "Glossary". bbcgoodfood.com. Retrieved 28 June 2017. ^ Gennaro, Laura; Leonardi, Cherubino; Esposito, Fabrizio; Salucci, Monica; Maiani, Giuseppe; Quaglia, Giovanni; Fogliano, Vincenzo (2002). "Flavonoid and Carbohydrate Contents in Tropea Red Onions: Effects of Homelike Peeling and Storage - Journal of Agricultural and Food Chemistry (ACS Publications)". Journal of Agricultural and Food Chemistry. 50 (7): 1904–1910. doi:10.1021/jf011102r. ^ OANCEA, SIMONA; DRĂGHICI, OLGA (May 2013). "pH and Thermal Stability of Anthocyanin-based Optimised Extracts of Romanian Red Onion Cultivars". Czech Journal of Food Science. 31 (3): 283–291. Retrieved 29 June 2017. ^ "Onion Turda on the Harvest Day in Cluj" (in Romanian). turdanews.net. Retrieved 30 June 2017. ^ Friday 6 August 2004 16:39 (6 August 2004). "Flavour of the Med - 6 August 2004". CatererSearch. Retrieved 19 September 2013. Wikimedia Commons has media related to Red onions.